Home>Reviews> Review: Scarface's "Deeply Rooted"
Scarface's new album dissects a midlife crisis. Despite his notoriety as a pioneer of Southern rap music and lyrical depth, Scarface remains low-key with his legendary status. And reasonably so. There’s a lot going on in the mind of the 44-year-old Geto Boy. While his poetic lyricism has sold him countless records, both as a member of Geto Boys and as a solo act, it is founded in darkness-- a darkness that he delved into in his no-holds-barred memoir, "Diary of a Madman." Drug use, drug sale, suicide attempts, parental death and abandonment-- you name it, Scarface endured it. So, it should come as no surprise, after stints of contractual purgatory and financial woes, that in his middle-age, Scarface takes things in stride. That’s why it’s so important for him to stay rooted, as Face’s newest instalment Deeply Rooted and its sort-of-title track suggests. “I'm only just now coming out of my shell and learning to deal with people... I'm only just now learning to be a normal person," confesses Face late in his "Diary of a Madman." And in many ways Deeply Rooted is an anthem of enduring these sort of variables so to free one’s self to be able to come out of their shell: “I’m living proof there’s no excuse,” he says on “Anything.” Putting his memoir to instrumentals, Face achieves a vulnerability that separates himself from other rappers. While he may be Scarface, on Deeply Rooted he is willing to wear the mask of his tormentors, including his former self (or selves), in order to conquer them, both literally and lyrically. The bouncy “All Bad” hones in on life’s endurance test from a grass-is-greener perspective, the smokey bass of Scarface making his priorities clear from the other side. On the aptly named track “God,” Scarface takes on perhaps the most daunting role Deeply Rooted has to offer-- God himself. In tandem with the vocals of John Legend (one of many high profile cameos on the record), Face uses his first verse to muse how he’d handle the almighty power and omnipresence of God if it were his own, manifesting “a safe place, for the young to come out if they want to play/I let their mommas know that they ok/And when y'all pray, I'll respond so you can all see a sign/And answer every pray one at a time.” “God” becomes the best track on the album, though, when the tables are turned and God is taken out of the equation-- in the second verse replaced by the devil, and in the song’s concluding verse, his absence. Tackling tricky subject matter like religion from all possible angles with such dexterity while losing little-to-no cred is something very few emcees can do, and it’s something that Scarface has made a career out of. Deeply Rooted is no exception. Shout outs go to N.O. Joe and Mike Dean, whose production on Deeply Rooted is the silent show stealer-- with a sound that adapts with the times but effortlessly keeps that classic key/drum combination sound residing right in Scarface’s wheelhouse for him and his collaborators to knock out of the park. In an interview with Rolling Stone, Face said of Deeply Rooted that it’s “basically just me doing me.” He wasn’t lying. In regards to the album’s place among the rest of Scarface’s discography, Deeply Rooted ranks high up there despite it not providing anything particularly surprising, or anything that deviates from the usual Scarface sound. But sometimes that’s all we as a hip-hop audience need, sometimes that’s all we want. Is A Drake X Future Collab Coming Soon? 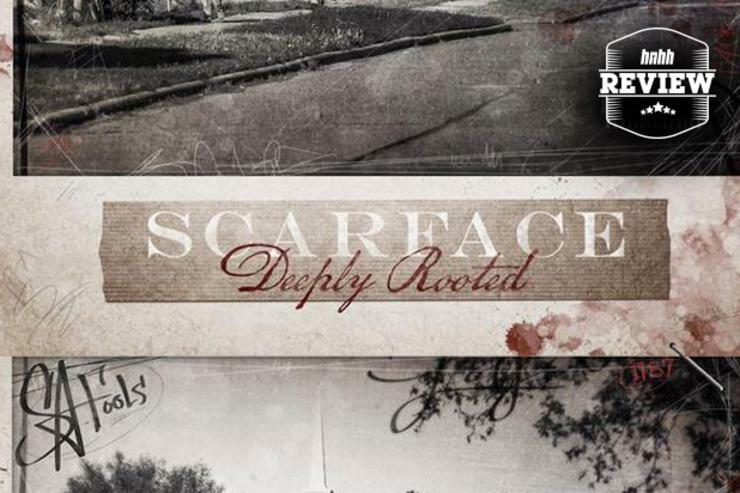 REVIEWS Review: Scarface's "Deeply Rooted"